Rice’s ReTweet would soon be shortened to RT due to Twitter’s 140-character limit and the practice of retweeting was quickly adopted by other users, third-party application developers and eventually by Twitter itself. Users and third-party apps developed their own retweet practices. Most commonly the whole tweet would be copy pasted and prefixed with RT @username (of the original poster) but some users would modify the retweet slightly by editing it so it would fit the 140-character limit. This also gave rise to the ‘fake retweet’ by pretending to retweet an existing tweet, but instead, this tweet would be newly created. Such fake retweets often concern celebrities, where users will impersonate celebrities by creating (humorous) fake retweets. In addition, these fake retweets were used by spammers by including spammy links in the tweets to trick users into thinking a reliable account had sent out that link, and therewith posed a security problem for Twitter. 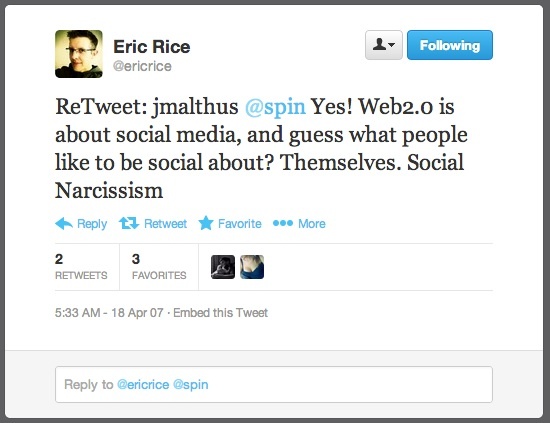 In August 2009 Twitter announced the initial steps in the implementation of the retweet as a ‘native’ feature of the platform in a blogpost which explicitly referred to the adoption of a practise developed by its users. Some of Twitter’s best features are emergent—people inventing simple but creative ways to share, discover, and communicate. One such convention is retweeting. When you want to call more attention to a particular tweet, you copy/paste it as your own, reference the original author with an @mention, and finally, indicate that it’s a retweet. The process works although it’s a bit cumbersome and not everyone knows about it. This is also how many features in blog software became formalized and standardized such as the permalink which was created by bloggers to create a permanent URL for a blog entry, and was implemented after other bloggers openly requested such persistant references for their blogposts in their blog software (Helmond 2008). After Twitter adopted the user practice of retweeting and implementing it as a ‘native’ feature in their platform they added a retweet icon to their web interface and tweets could now be retweeted with a single click. This tweet would be integrally retweeted and created a verbatim copy, eliminating the possibility to create fake retweets. However, some users would continue to manually create (fake and real) retweets, but more importantly, third-party apps offered a variety of retweet mechanisms. Some apps would automatically add RT in front of a retweeted tweet and allow modification, while others would “quote” a tweet to indicate a retweet. While we can now visually distinguish between native retweets and non-native (potential fake) retweets it is important for researchers to note that there is no such thing as a singular type of retweet. Thus, when doing a form of retweet analysis one should take the historical background of the retweet into account with its various user practices and uptake by third-party applications. 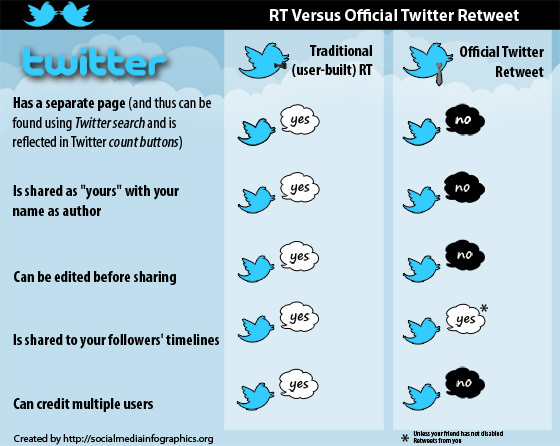 Conducting retweet analysis using the Twitter API means that other types of retweets will be excluded from the analysis, which should be noted in the research design.